Miniumum price of sugar to disappear! As a result of new EU legislation, the minimum sugar price will disappear. This means that floating contracts will replace traditional fixed price contracts. To overcome the price risk that is associated with these more flexible contracts, financial trading in sugar will increase. In this article I will explain the impact that price risks can have on your business. Furthermore, I will explain how to calculate and manage these risks. The European Union will remove production and import quotas and the minimum price floor for sugar-beet farmers from October 2017. European farmers are then able to freely export any additional supply they might have. Consequently, this could turn the EU into a bigger competitor in markets outside the European Union. 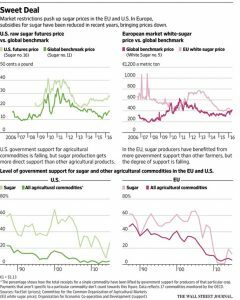 In the past, the EU sugar price floor has been higher than the sugar price traded on global markets. The following graph shows the EU and US sugar prices in relation to the world market price over the past ten years. After the steep decline from 2011 to 2015, prices have gone up again. Record sugar output in 2014-15 caused supplies to be carried over into the 2015-16 quota season. As a result, producers had to lower output in 2015-16. “Lower EU production in 2015-16 […] in connection with the prospective deficit on the global market and lower imports into the EU initially triggered a stabilization since early 2015 and recently caused the significant increase in EU sugar prices,” Commerzbank said. “The entire sugar world is going to be shaken up,” said Hartwig Fuchs, chief executive of Nordzucker AG, Europe’s second-largest sugar producer. Mr. Fuchs estimates that Europe has the potential to add an extra 3.5 million tons yearly onto the global market. The question is whether this surplus production of sugar will lead to lower prices. It could be, but then again, demand for sugar is also growing. Notably Asia displays an higher demand, combined with increased production of ethanol. KYOS expects that the traditional fixed price contract will be more and more replaced by indexed (floating price) contracts. We have seen this transition in many other traded commodity markets like aluminium, wheat and natural gas. Sugar producers will offer indexed prices to sellers (upstream) of sugar beet/cane. They will sell refined sugar (downstream) based upon the same index + certain refining premiums. The effect for the sugar producers is initially not that big. Most likely they will pass on the price risks where they can. Industrial food and beverage companies on the other hand will have to manage this price risk. If the past is anything to go by, it only goes to show that sugar prices are very volatile. For most industrial food and beverage companies sugar price risks will be just another addition to their risk portfolio. Think about foreign exchange (FX), interest rate exposures and/or specific commodities. Industrial food and beverage companies need to estimate their cash flow for budgeting purposes. With indexed sugar contracts it is more difficult to forecast the cash flow. To be able to make these estimations they use sugar forward curves on a specific day as a budget reference. This is fine if prices are relatively stable. In case of frequently changing prices or high volatility however, you will need a more active approach. Volatility is an indicator for the magnitude of price changes. Historically, sugar prices have shown a high volatility. As a reference, the current sugar price volatility of >25% is three times higher than the volatility of the Euro to US Dollar exchange rate. This newly introduced sugar price risk can cause significant swings in future cash flows. 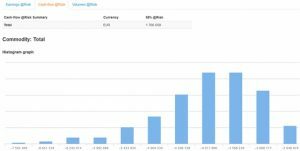 This potential magnitude of these swings might be of a level that some companies have not experienced before. Have you already thought about the consequences a 30% increase in sugar price may have for your business? How much will it cost you to purchase 10.000MT raw sugar in a year? With current market prices, the costs are EUR 4.4 million. As already mentioned, the minimum sugar price will disappear in October 2017. Will there be any implications for the sugar price? Historically the global trading price was lower than the EU sugar minimum but sugar market prices are volatile and can move up or down quickly (see Figure 2). The figure above shows historical prices for sugar for the EU. Early 2011 saw the highest peak of 33 US Dollar cents. That high has not been reached recently. In the last 12 months however, the sugar price has gone up from 10 US Dollar cent to 20 US Dollar cent. In other words, an increase of 100%! The sugar producers will pass on this price risk of rapidly changing market prices to you. In case of a price increase, how flexible are you in passing these on to your consumers? As a CFO you need to act and manage these risks upfront – as the example given here shows that doing nothing can cost you 40% more. You do not want any nasty surprises that fluctuating prices can have on your cash flow. To mitigate these risks you can use hedging. The most commonly used price risk mitigation method is with futures and/or swaps. With these financial hedging instruments, you are able to switch from floating to fixed prices. Two commonly used sugar futures are the No 5 and No 11 contract. The No 5 contract is the reference for white (refined) sugar and quoted in US$/metric tonne. The No 11 contract is the reference for raw sugar (canes) and quoted in $cnt/Lbs. On the exchange (www.theice.com) you can trade both type of contracts. As we expect a large shift towards indexed contracts we expect a boost in financial hedging. Financial hedging using futures/swaps can mitigate the sugar price risks effectively if used in a professional way. To help you understand these price risks and improve your cash flow prediction, KYOS has developed risk management software to effectively manage your commodity portfolio. This software is tailor-made to reflect your specific requirements. The KYOS commodity portfolio & risk management system captures years of industrial experience in managing budgets, commodity contracts, hedging, market price analysis and cash flow forecasting. Are you still using different spreadsheets to calculate your numbers? Whether you are in Procurement, Sales, Finance or Treasury – every department needs good, dependable figures. I am confident a good cash flow forecast will make your life easier. Please do not hesitate to contact me so we can discuss how we can help you save time – and probably money too.